This blue pumpkin isn’t a trick—it’s a green light for special treats. One in thirteen children struggles with food allergies, which can turn trick-or-treating into an actual ‘Fright Night’. This year, teal pumpkins are popping up in front of thousands of houses to signify their offering of allergy-free treats for kids on Halloween. The Teal Pumpkin Project was developed in an effort to encourage households to make the holiday more inclusive for kids who are allergic to nuts, chocolate, soy, wheat, and milk. About two kids in every classroom are at serious risk of being exposed to those foods, yet candy sold in bulk usually does not have ingredient labels or allergen warnings. As an alternative, people taking the Teal Pumpkin Pledge can buy non-food treats for mere nickels at the dollar store, spooky gifts like glow sticks, bubbles, kazoos, spider rings, stickers, and vampire fangs. Even toys can be a tricky road, though—Play-Dough, for example, contains wheat while other toys may contain common allergens like latex. Alternatively, the Bay Area Allergy Advisory board has posted these handy lists of allergen-free candy. Over 100,000 households in all fifty states have painted their pumpkins teal to signify allergy awareness for the coming Halloween season. 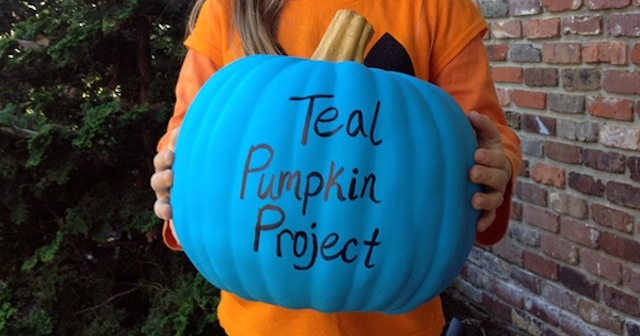 The #tealpumpkinproject website also has lots of flyers, signs, and gift ideas that can be downloaded for free. For those planning to hand out regular candy along with allergen-free treats, it’s advisable to keep them in separate bowls (and remember which is which).